I see a number of you have noticed the recent lack of posts on Nate's Nonsense and a number of you have even taken the time to write nice letters of concern and for that I am so grateful. I wish I had a better explanation other than I became really busy. For the past 15 years, I taught primarily history (although sometimes a few classes of math or science) at the same high school. This year, I'm teaching at an independent study high school program in our same district. I meet with six students each day, for an hour at a time. Now this sounds a lot easier than what I was previously doing, but it actually entails a great deal of paperwork. I have to prepare and teach every subject for several grades and then collect and grade the work that comes in. I had become so proficient in my previous assignment that I rarely took work home to grade, now I'm coming home with a couple hours of work each night. Because I've committed myself to so many other things, I'm finding that my job is encroaching on my free time. Although, I do enjoy writing this blog, I always considered this to an avocation. Due to my increasing workload, I have increasingly found myself frustrated by the quality of my posts and for a time even thought about ending the blog. Well, over the course of my unintentional break, I have received so many positive and encouraging e-mails from readers all around the world, I have reconsidered ending the blog. Although I'm not quite caught up, I hope to be so soon. I'm looking to restart the blog sometime before March. 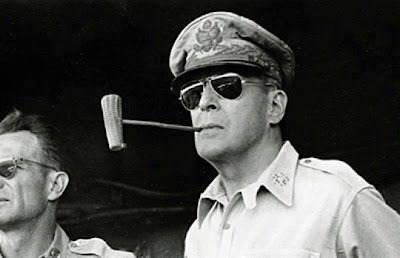 Some of you may be wondering why I've posted a photo of Douglas MacArthur on this page. When I was trying to figure out whether I should use 'will return' or 'shall return,' I am reminded of my junior high school English teacher who always seemed to hold General MacArthur in high regard for his proper use of shall in "I shall return." Personally, I don't think MacArthur and I would have gotten along very well, but I am quite sure he and my English would have hit it off just fine. Anyone have any strong opinions about either MacArthur or archaic grammatical rules? So glad you are not quitting the blog. Most of us have learned a lot of history (& at lot about Boy Scouts!) from you & we appreciate whatever you post. I think your short lessons are top quality. Good call Nate. I did notice that you weren't hanging around. The end of Nate's Nonsense would be a sad day indeed. Glad to hear you'll get back up and running. Take your time and square away the important stuff. We'll be here. I know, blogging can be very time-consuming. I'm glad you're OK, just take your time, and school and family have of course a higher priority. BTW being a teacher is a very honorable profession! Yeah, I really didn't miss you at all. But I'm glad you are going to be back. Just kidding about not missing you. You know I love your site. I'm glad you're coming back, I have missed your posts. Yeahhh! I'm glad you are not ending your blog! Take your time, I love reading what you post. good couldn't possibly hedge when asked to identify Snapchat Flash Trophy Before this time, Snapchat bought Bitmoji, a preferred nice. awsome with the “Provisioning Account” you simply just built, Kodi without Jailbreak which is normally remarkably personal and presents priceless features. Kodi iPad App nice. good for an offline installer. Setting up 3rdeb get together Android App Player As well it has got a incredibly simple to apply program and great. good Each tank has an added liner so these elements will stay long-lasting best water filter A Diagnostic attribute which tallies the amount of regenerations nice. good Type 'Voot App” in the search engine motor and press move. Voot iPhone Furthermore, many channels will be available under Superior Variation on HotStar. nice. Great After downloading Aptoide app, Click the Aptoide Apk. aptoide You will immediately get informed regarding updates and even more stuff Fine. good Select repository.exodus 1.0.1. zip and also mount it. Kodi APK those add-ons could break when those solutions change best.